I’m slowly, surely, resolutely and absolutely regaining lost advantage. Time was, before my extended colonial (felt more like colonic) exile, the waiting warriors of the Wong Kei on Wardour Street actually recognised me: at my appearance in the doorway their faces broke into smiles, I was greeted with hellos AND priority seating – even on Saturday nights with the 4-storey stairwell sardined floor to ceiling with bridge-and-tunnelers. And why? My extravagant beauty and boundless charm of course; or ponder this: maybe it was because I was a regular punter and – this is important – I always tip at the Wong Kei (nothing beats cold cash & coin at melting inscrutable hearts). And I do believe if any waiters deserve a tip it’s these dudes: brusquely efficient, they’re too busy working to tell me their names, spiel out the specials (there are none) or inform me fatuously that they’ll be my waiter for the evening, but I have never known them to be rude. When my teapot needs replenishing it’s done with neither wave nor word required – talk about discreet – and our food arrives hot to trot: nothing gets to hang around the dumb waiter here. 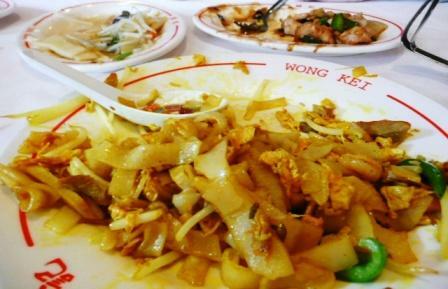 I love eating at the Wong Kei; it’s good, it’s cheap and the streetwise professionalism of the waiters is pure entertainment when one’s companions are not. And if your Soho Saturday night is shaping up on the dull side, just try walking out of here without paying – you’ll suddenly be the (anti-)hero of your own little Jackie Chan movie, only without the humour. Or Jackie Chan. I saw two hicks attempt such a dirty trick one busy but not-so lucky night (for them); the mix of militaristic precision and street-brawl outrage with which the waiters shot into active response was poetry in motion – and with all their shouting it was thrilling indeed. Actually, don’t try this; just believe me or you will regret it and I have no idea if you’ll live to tell the tale, but I rather hope you won’t.